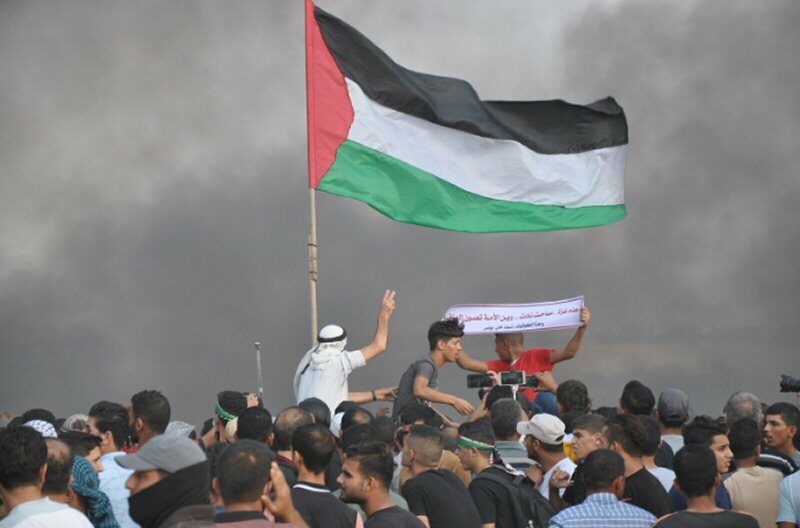 On Friday, 19 October 2018, in excessive use of force against peaceful protesters on the 30th Friday of the March of Return and Breaking the Siege, Israeli forces wounded 275 Palestinian civilians, including 49 children, 3 women, 3 journalists and 4 paramedics, with live bullets and directly hit teargas canisters in eastern Gaza Strip. Ten of those wounded sustained serious wounds. PCHR’s investigations and fieldworkers’ observations emphasize that the Israeli forces heavily opened fire at the protestors, inflicting many casualties. Though no killings were reported, there were 10 persons seriously wounded. Moreover, though limited attempts to approach the border fence were reported in the demonstration areas, there was no imminent threat posed to the life of the Israeli soldiers and the protests were totally peaceful. PCHR’s fieldworkers did not witness any armed manifestations while the Israeli soldiers continued to position on the top of sand berms and hills, in military jeeps and tanks along the border fence. This proves that Israeli forces continue to use excessive force against the protestors upon highest Israeli military and political echelons despite no danger or threat posed to the life of Israeli soldiers. It should be mentioned that before the protests started today, the Israeli forces deployed large forces and tanks along the security border fence with the Gaza Strip and adjacent to residential areas in the vicinity of the Gaza Strip. At approximately 15:00, thousands of civilians, including women, children and entire families, started swarming to the 5 encampments established by the Supreme National Authority for the Great March of Return and Breaking Siege along the border fence, east of the Gaza Strip governorates. They raised flags and chanted national songs. Hundreds, including children and women, approached the border fence with Israel, set fire to tires and gathered 300 meters away from the main border fence. Some of them attempted to throw stones at the Israeli forces, limitedly threw Molotov Cocktails and pulled parts of the second barbed-wire few meters away from the fence established inside the Palestinian territories few meters away from the border fence and in limited cases, they threw Molotov Cocktails along the border fence. However, there was no threat posed on the lives of Israeli soldiers stationed behind barracks and sand berms, 70 meters away the border fence. The Israeli shooting, which continued until 18:30, resulted in the injury of 275 civilians, including 49 children, 3 women, 3 journalists and 4 paramedics, were hit with live bullets and direct tear gas canisters. Ten of those wounded sustained serious wounds in addition dozens suffering tear gas inhalation and seizures after tear gas canisters were heavily fired by the Israeli soldiers from the military jeeps and riffles in the eastern Gaza Strip. Moreover, at approximately 17:25, an Israeli drone launched 2 missiles at civilians in an olive field that is around 800 meters away to the west of the Return encampment in Khuza’ah in eastern Khan Younis. As a result, 4 civilians were wounded.